There are now close to 2bn smartphones on earth. How to ecosystem dynamics work at this scale? What kind of market share matters? It looks like the winner-takes-all dynamics are different, and seems clear that both Apple and Google have sustainable positions. 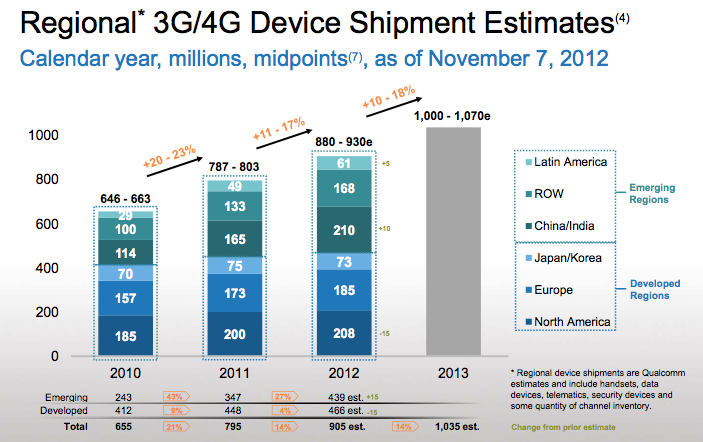 A fascinating set of well-informed estimates from Qualcomm for 3G device shipments by its licensees. This includes all devices (dongles, mifis, tablets etc). There is a very obvious shift in the overall mix towards emerging markets. China/India have now passed North America. Amongst other things, this bears on ever-growing Android activations, which are strongly weighted to emerging markets: Android has 75% global share of smartphone sales but only ~50% in the USA. A lot of that 3G growth in India/China/Other are Android devices.